The Pluto Safari app's home screen. A new app lets you follow the progress of NASA's New Horizons spacecraft, which is in the home stretch of its historic mission to Pluto. New Horizons will make the first-ever flyby of Pluto on July 14, zooming within 7,800 miles (12,500 kilometers) of the dwarf planet's surface. The Pluto Safari app, which came out last month, keeps tabs on New Horizons, counting its close encounter down to the second, and teaches users about the frigid, distant realm the spacecraft is exploring. "We didn't want to put a price on it, because we wanted to get it in the hands of as many people as we could," said ‪Pedro Braganca of Simulation Curriculum Corp., which developed the app. New Horizons' flyby "will be an incredible achievement," Braganca told Space.com. "So we wanted to sort of capture that moment, and help to draw people to feel excited about this mission." Pluto has remained mysterious since its 1930 discovery, because it's relatively small and lies so far from the sun (3.65 billion miles, or 5.87 billion kilometers, on average). The object is the last of the solar system's nine once-recognized planets to be visited by a spacecraft; the last such "first reconnaissance" came in 1989, when NASA's Voyager 2 probe flew by Neptune. New Horizons "is going to give us our first clear look at this world and its moons," Braganca said. "It doesn't get more exciting than that." Pluto Safari provides interactive views of the current locations of Pluto and New Horizons, lets users explore a 3D model of the spacecraft and the five-moon Pluto system and helps people find the dwarf planet in the sky. 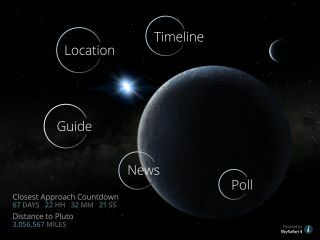 The app also features a multimedia guide to Pluto, a timeline of New Horizons' milestones and updated news about the mission. Pluto is no longer recognized as an "official" planet; in 2006, the International Astronomical Union (IAU) demoted the object to "dwarf planet" status in a decision that remains controversial to this day. Pluto Safari gives some background about this issue and includes a poll, asking users if they agree with the IAU's decree. New Horizons' mission doesn't end with the flyby. The spacecraft will continue relaying data back to Earth for more than a year thereafter, and it may study another body beyond Pluto in 2019, if NASA approves this proposed extended mission. So Pluto Safari will continue to track New Horizons' location beyond mid-July, Braganca said. You can learn more about Pluto Safari, and download the app, here (for iOS) and here (for Android).